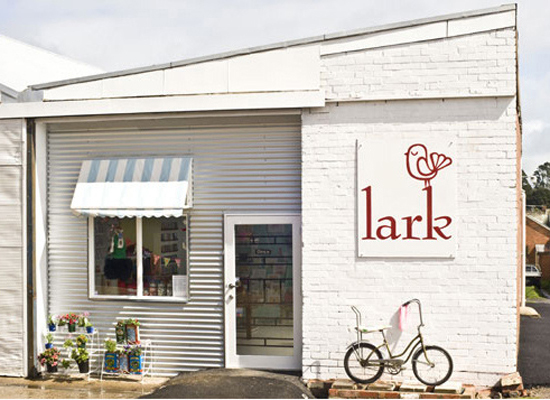 FK talks to Allison from Lark in Daylesford in Rural Victoria about her lovely little store. Tell us about Lark and how it came to be? 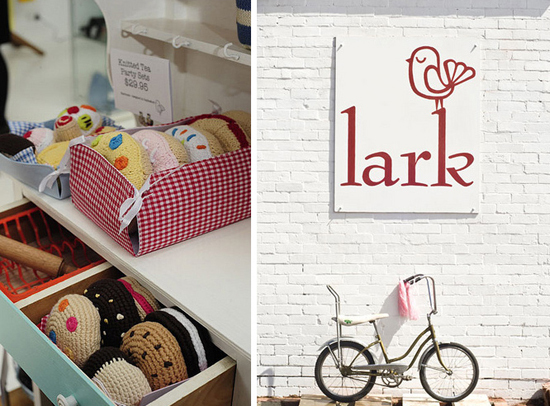 We make and sell our own range of toys and accessories to shops, and we also represent other indie designers, so when we moved Lark out of our home into an old factory building in the centre of Daylesford, it just seemed like a great opportunity to open a little shop front. To add our own ranges, I approached some of my favourite designers from Melbourne and the best local crafters and artists. What treasures can be discovered at Lark? 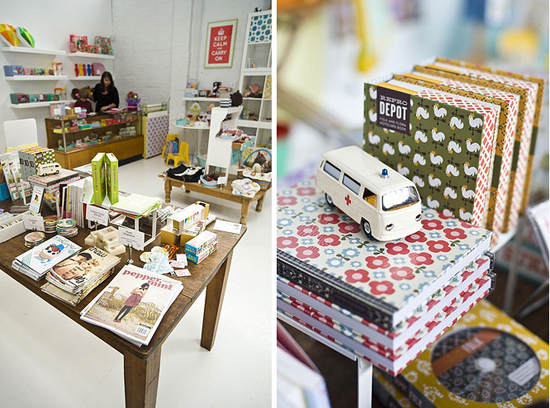 Oh, so much handmade, crafty and cute goodness! We currently have jewellery from Victoria Mason, Naomi Murrell, Little Shop Of and Betty Jo, art prints from Belle & Boo, a wide range of craft zines, books and stationery, Lark toys and vintage accessories, Genki tee-shirts, the new Beci Orpin range of homewares and accessories, handmade bags, laptop cosies, brooches and purses, baby clothes made from thrifted fabrics, Twiglet sleepy lion cushions, picnic sets, Japanese masking tape, knitted Christmas ornaments and lots more. 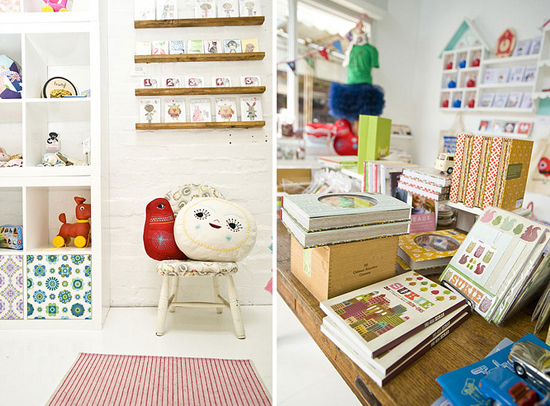 What do you look for when sourcing products to sell in your shop and how do you source them? I am looking for something that’s quite hard to define. If something I see makes me want to jump for joy, then I know it is right for our shop. Everything (with the exception of books) is made by small indie companies who I admire, I think it’s important that there is a person behind every product, someone who loves what they do. Other than that, the things I pick tend to be colourful, nostalgic, pretty, clever, well-made and a bit quirky. I meet a lot of crafters and designers through the craft markets and trade fairs I’m involved in, so that tends to be my first port-of-call when sourcing for the shop. I’ve also found some great people through Made It, Etsy and blogs. And I travel whenever I can, visiting boutiques and markets all over the place for inspiration. What sort of people can we find shopping at Lark? People who are looking for hand made and unusual gifts, lovely crafty girls, local teenagers, blog friends, Daylesford tourists, young families and grandparents who love the handmade and nostalgic toys that we sell. We often have multi-gernerational families coming into the shop – a grandmother, mum and kids, sometimes with cousins and aunties too. Plus lots of the girl groups who come to Daylesford for hen parties and pampering spa breaks. The zines and books have been surprisingly popular. The Handmade Helps Recipe Book (100% of profits to the Salvo’s bushfire appeal) flies off the shelf, as do the latest issues of Peppermint, Mixtapezine, Thaw and others. We have a really good range, and it can be hard to find indie magazines here in the country. We also get a lot of people asking our advice about what to do in Daylesford, and we are more than happy to help. 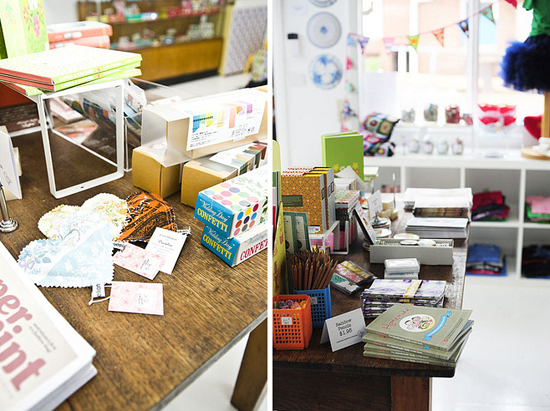 When not at the shop, what is your favourite thing to do in Daylesford? Wandering around the Sunday fleamarket with my son, followed by a picnic lunch with friends at the lake or the botanical gardens. Meeting new people and hearing their stories has been an unexpected bonus of opening a shop. A local family moving back to the country after a year in the city; a customer whose baby (now a lively 11-month-old) was born at only 28 weeks and spent 10 weeks in hospital; girls hoping to start their own craft businesses. Every day someone new comes into the shop for a browse and a chat. I love that. What has been the biggest hurdle to overcome? When I first saw the old factory building, I couldn’t imagine how we could turn it into an attractive shop. It’s tucked away in a lane behind an op shop, and inside it was filthy and dark. I had no idea what to do, but on a trip to Tokyo I found the most beautiful little boutiques tucked away in all sorts of unusual buildings and they really gave me lots of visual inspiration for the shop. We decided to go with its strengths – painted brickwork, galvanised metal, exposed ceilings, and prettied it up with flowers, a large shop window and a stripy canopy. It looks cute now, and the destination hasn’t been a problem, as most of our customers hear about us through word-of-mouth anyway. I was just in Daylesford last week but I missed seeing Lark! Oh well, I think another trip is required.